Make sure your store is following the latest EU's GDPR legislation requirements. With the Magento 1 GDPR extension, you can store and process customer data in the most effective and transparent way that fully complies with the data protection regulation terms. Starting from May 25, 2018, the General Data Protection Regulation (GDPR), took effect and changed the rules of how companies collect, store, or process users' information. This regulation affects businesses far beyond the borders of the EU. That's why the Magento GDPR extension is a must-have addition to your e-commerce store and the important tool to follow the latest legislation requirements. What does the Magento GDPR extension provide? Customers can utilize their right to control and delete their personal data provided by the EU's GDPR resolution, as well as modify the given consents. Any action in the privacy settings section of the cutomer account requires a password. When a customer needs to download all data, anonymize information or delete an account, than the password should be filled in to perform the further actions. To comply with the EU's GDPR requirements, your customers should have the ability to download all personal information or anonymize it. The Magento GDPR extension adds such functionality to the users accounts. Now, shoppers can get a CSV file with private data or use the anonymization option to hide the information. NEW | Amend the list of EU countries from the admin panel in case of any legislative changes. According to EU's GDPR, each user should have the ability to delete the account and make sure the personal data has been removed. The Magento GDPR extension guarantees this right for your customers and enables them to leave a request to delete the account. You can manage these requests from the appropriate grid. On the extension conifugration page you can disable any of the available privacy settings sections: download and anonymize data or request to delete account. NEW | Place the cookies consent pop-up bar at the top of the screen or at the bottom. Easy installation, works well out-of-the-box. 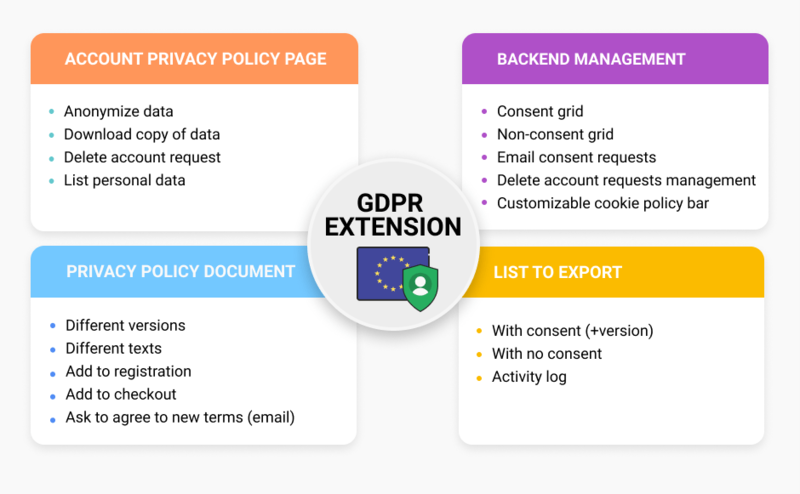 The extension makes it easier and faster to make a store GDPR compliant. I tried a number of free extensions but they bugged so much that my developer said we would spend more time on rebuilding the app than doing the job from scratch ourselves. So I dropped the idea to get it for free and came across Amasty extension. I like how it works. Yep, there are sometimes minor issues but they are fixed within short time. I use checkout and layered navigation by Amasty and I’m very satisfied with their modules and support. So when I heard about GDPR I was one of those who attacked their support with requests for necessary updates. Sorry :) I’ve been using this module right since the release. It was easy to install and run. It has some cons but Amasty keeps improving it. So thanks, guys! I like the extension though I had compatibility problems in the beginning. I run an earlier version of Magento than required, so the extension bugged. Yet Amasty support was very helpful to settle my issue and as far as I know they improved in general compatibility of their module with other systems, so such things shouldn’t happen any longer. In general a fine module that makes a Magento 2 store in line with GDPR. However there should be several improvements, like compatibility with custom themes and not-Amasty extensions. Waiting for updates. Extension is great as it does what it says, but unless you use default magento checkout and registration form, you will need some template knowledge. There should be a manual how to add to custom checkout and registration from. Extension essential to meet 100%, with current regulations. Easy to configure and above all, made by amasty, which means that the code is well done, and have a great support.